The best air purifiers for pet hair capture dander, pick up airborne cat and dog hair, don’t produce harmful emissions, and work efficiently to keep the air fresh day and night. 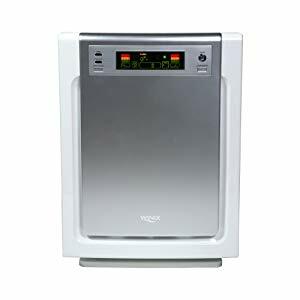 That’s why we chose the Winix WAC9500 Ultimate Pet as the best air purifier on the market. For just over $200, this pet-specific purifier efficiently cleans medium-sized rooms, captures allergens, and has smart features for an effortless purification experience. If you’re new to the world of air purification, scroll down below the reviews to read our buyer’s guide. You’ll learn how to decode air purifier lingo, which features matter, and how to identify the purifier that’s right for you. This guide is the result of hours researching air purification technology, identifying key quality indicators, and evaluating over a dozen air purifiers on performance, usability, customer satisfaction, and price. This air purifier was designed for pet-inclusive homes. It has a true HEPA filter to capture allergens, captures hair in the pre-filter, and has a carbon filter to neutralize odors. In addition to the basics, the Winix has a couple of active purification features. The Winix Ultimate Pet air purifier features CleanCel, an anti-bacterial coating that neutralizes bacteria. It uses PlasmaWave technology, which is an electric oxidizing system using plasma ionizers. The PlasmaWave technology breaks down airborne pollutants on a molecular level. Like all ionizers, it produces a trace amount of ozone, but a company representative explains that these ozone byproducts amounted to less than 10 ppb, which is not considered a hazardous amount. If you’re not comfortable with the ionizer, you can always disable the PlasmaWave technology some or all of the time. If you want to let the Winix think for itself, you can switch it to AutoMode. This mode uses Smart Sensors that detect air quality and automatically switch between four speed settings. To keep you in the loop, information from the smart sensors is sent to the display screen. The screen shares valuable information including real-time air purity updates and LED alerts letting you know that it’s time to replace the filter. The lights dim in accordance with the ambient light in the room. It’s recommended for a 283 square foot room. According to AHAM testing, the unit’s clean air delivery rate is 194 cubic feet per minute for pollen, 182 for dust, and 183 for tobacco smoke. Careful thought went into the design of this air purifier, and it shows in both the product’s performance and its nearly $900 price tag. The IQAir HealthPro Plus is an advanced purifier designed to produce medical-quality air. It’s made with a patented HyperHEPA® filter, which is up to 100 times more effective than a standard HEPA filter. It captures 99.5% of particles down to 0.003 microns in size—particles ten times smaller than a virus. In addition to the HyperHEPA filter, the purifier includes a 5lb activated carbon filter, which absorbs and neutralizes odors. To ensure that no ultrafine particles escape the purifier, it has a 3D UltraSeal™, which is intended to prevent the seepage common among air purifiers. The purifier is fast and efficient with a CADR of 300 cubic feet per minute. It’s rated for rooms up to 1,125 square feet. In addition to multiple fan settings, the digital interface allows you to key in exactly how many cubic feet you want the purifier to clean each minute. The company’s patented HyperHEPA filters typically last for about a year of constant use. An LED filter replacement light on the display screen indicates all four stages of the filter’s life and lets you know when it’s time to replace it. The digital display also tells you how many hours are left in each filter, including the pre-filter and carbon filter. The IQAir HealthPro Plus comes with a lifetime warranty. This air purifier has several thoughtful features that set it apart from the rest. For one, it’s smart. The Alen Breathesmart automatically analyzes air quality and self-adjusts for efficient cleaning. As the laser Smart Sensor monitors the presence of airborne particles, an air quality indicator light displays air quality in real time. Instead of a disruptive operating noise, the Alen BreatheSmart generates pink noise and is quiet enough to run while sleeping. Perhaps most exciting for decor lovers is its sleek appearance and infinite color variety. 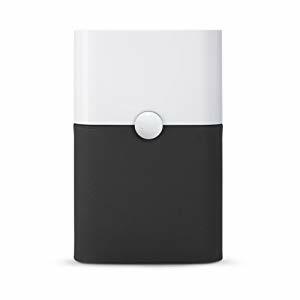 In addition to coming in eleven colors, the Alen Breathesmart is available with a white primer finish, allowing you to paint it a shade you love. The HEPA OdorCell filter is a true HEPA filter capable of filtering out allergens and other small particles. It contains 1.5 lbs of Alen’s proprietary odor eliminating compound, which neutralizes litter box smells and other odors. It’s rated for rooms up to 1,100 square feet. It’s Energy Star-certified, using the same amount of electricity as a 105 watt light bulb. 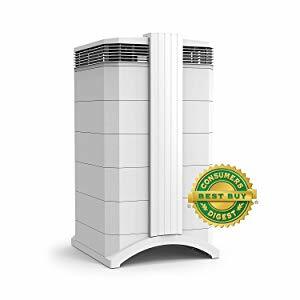 This model from Blueair is moderately-priced, looks great, and performs well, but it lacks a true HEPA filter, so it’s not the best choice for people with pet allergies. The purifier features a three-level filtration system. The primary filter, while not a HEPA filter, appears to perform well. It’s coupled with a fabric pre-filter that stretches around the outside of the unit. The pre-filters are available in multiple colors, so you can customize your purifier’s appearance to suit your preferences. The purifier also features a carbon filter to neutralize odors. It’s recommended that you replace the filters once every six months. The Blue Pure 211+ is Energy Star rated for best in class energy efficiency. It uses 60 watts on the highest of three fan speeds. Regardless of which speed you choose, the purifier is relatively quiet. Multiple reviewers comment on the purifier’s low noise output. This model is rated for large rooms and can clean spaces between 400 and 600 square feet. It’s AHAM rated at 540 square feet and, with a CADR of 350 cubic feet per minute, cleans the air about five times per hour. Despite being one of the most quiet air purifiers on the market, some customers are disturbed by the Blue Pure 211+’s operating light, which doesn’t turn off and may be too bright at night. At under $60, this unit stands out as a top pick for shoppers on a budget. It’s an all-around good performer for people who need to capture pet hair, but lacks the filtration ability to catch the smallest allergens. This air purifier features a permanent 99% HEPA-grade—not true HEPA— filter. A reusable filter translates to no replacement costs and less hassle. Instead of buying a new filter, Hamilton Beach encourages users to occasionally clean the permanent filter with a vacuum. It also has a permanent pre-filter to capture larger particles. Again, the main filter is not a true HEPA filter. It captures particles as small as 3 microns. The smallest particles captured by this filter are 10 times bigger than the smallest particles captured by a true HEPA filter. In addition to the main filter and pre-filter, the air purifier comes with two replaceable carbon zeolite filters, which absorb and neutralize odors. It’s a relatively small, understated unit at less than one-and-a-half feet in height. You can use it either vertically or horizontally, so it’s flexible enough to use in cramped spaces. The purifier is recommended for use in a 140 square foot room. The company says that it offers “effective performance” in a room of this size, but doesn’t provide a specific clean air delivery rate. You can choose from three speeds for different noise levels and purification rates. Watch this Amazon customer’s review video to hear all three settings. Before we dive into all the technicalities of air purification, let’s ask a fundamental question. If this sounds like something you might think or say, you’re in luck. Even basic air purifiers can capture cat hair, meaning that you have plenty of options. Narrow down your options by defining your needs. Is your house small, medium, or large? Do you care about how your air purifier looks? 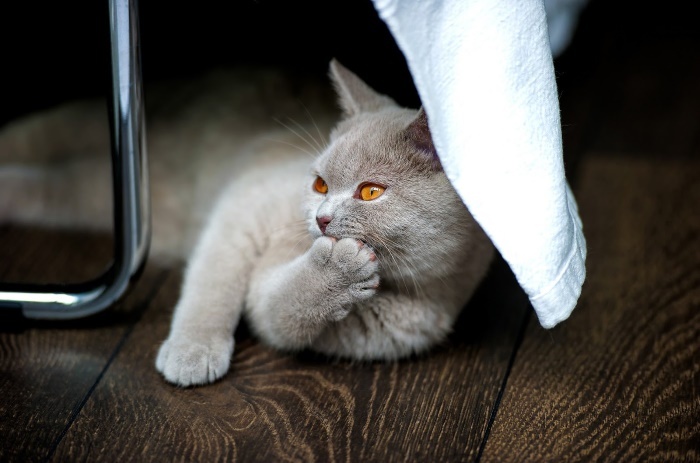 Is litter box odor a problem? What are you willing to spend? As an allergy sufferer, you need to remember that air purifiers aren’t a cure for allergies—you may still need to take medications for cat allergies and block off a cat-free zone in your home—but they can make a difference. If you choose one of the best purifiers on the market, that difference could be huge. Unlike the person who just wants to get rid of all the cat hair in the air, you need an air purifier with specific qualifications. Your allergies are triggered by an allergenic protein found, not your cat’s hair, but his skin, saliva, and urine. While any air purifier will capture hair, only the best can catch dander. This rules out some of the cheaper air purifiers on the market but leaves a broad selection of purifiers with varied unit sizes, styles, and features. What kinds of air purifiers are on the market? There are two fundamental types of air purifiers: active purifiers and passive purifiers. 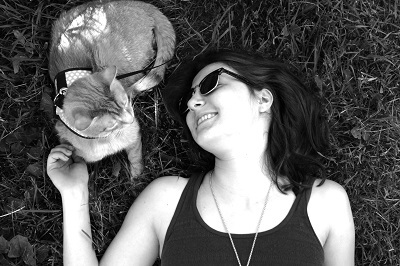 Let’s learn more about each type and how they handle cat hair. Passive purifiers have a system of filters that catch particles and prevent them from spreading through the air. Depending on the type of filters built into a passive purifier, it may be able to capture extremely small particles like dander and smoke. Less efficient purifiers will capture cat hair, but allow some finer particles to pass through. We’ll talk more about different types of filters later. Active purifiers sanitize the air. They destroy airborne bacteria, viruses, germs, and spores. If you’re worried about airborne particles making you sick, this is the type of air purifier you want, but remember that it won’t do much for cat hair. There are a few types of active purifiers. Let’s learn more about each. Ionizers release positive ions, negative ions, and sometimes both. There are two main types of ionizers. One type is called an electrostatic precipitator. This type of air purifier disperses ions, which attach to airborne particles before returning to an oppositely-charged collecting plate in the purifier. The second type is an ion generator, which releases ions into the air but doesn’t have a collecting plate. Instead of returning to a collecting plate, the molecularly altered particles linger on surfaces in your home. Both types release ozone. Exposure to too much ozone can cause chest pain, coughing, shortness of breath, and throat irritation. Avoid ionizers that produce more than 50 ppb (parts per billion) ozone. If a city was that ozone-polluted, sensitive residents would be advised to consider limiting their time outside. We’ve talked a lot about ozone as a byproduct of ionizing air purifiers, but it’s not always a byproduct—some purifiers intentionally produce ozone. Despite being a pollutant, ozone is an excellent air cleaner. In fact, it’s partially responsible for that fresh smell in the air during and after a thunderstorm. Lightning strikes produce ozone and that distinctive clean smell. Ozone generators eliminate odors and destroys airborne particles, including viruses, bacteria, and mold. Because they shock the air and eliminate hard-to-remove odors, ozone generators are popular among professional cleaners. The problem with ozone generators is that the amount necessary to sanitize the air can also cause breathing problems. If an ozone generator is safe to run all day and night in your home, it’s not producing enough ozone to have a significant deodorizing or air cleaning effect. UV lamps can destroy microbial particles including mold spores, bacteria, and viruses. However, most purifiers let particles zip past the UV light, not giving them sufficient exposure time and letting them pass through unscathed. It takes time for a UV light to destroy particles. Only choose UV sanitizers that expose particles to UV rays for a long enough time to destroy them. 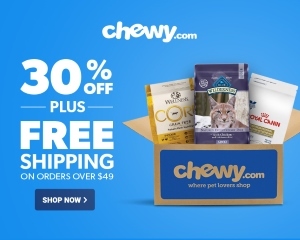 So which is better for cat hair? Do you need a passive purifier or an active air purifier? All of the snazzy features found in active purifiers do nothing for cat hair and dander. Whether you’re allergic or not, you need a passive purifier. If you require any additional purification, you can find a passive purifier with some active purification features, but they shouldn’t be machine’s central feature. We’ve gone over the two main types on the market, but there’s one more type of air purifier to consider. 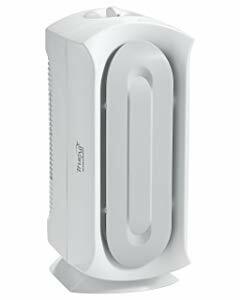 Most air purifiers cost between $50 and $1,000, with price usually commensurate with quality. If you want a simple passive purifier without dropping a fat stack of cash, consider making your own. A homemade air purifier is easy to construct using a box fan and a HEPA filter sold for air conditioners. This is a good option for those who want to experiment with air filtration before investing in a sophisticated purification system. Watch this video to learn how to make a simple air purifier at home. Choose air purifiers with an effective filtration system. The filtration system is the heart of the machine. Speed control, UV purification, stylish design, and other bells and whistles are insignificant compared to the purifier’s filters. Allergy sufferers need HEPA filters. Approximately 25% of cat dander particles are 2.5 microns or smaller, so allergy sufferers need a filter that can capture the tiniest particles. According to U.S. standards, true HEPA filters capture 99.97% of particles at a size of .3 microns and above. They’re the gold standard in medical facilities, cleanrooms, and have even been used to arrest radioactive contaminants. Don’t be fooled by sellers who describe their filters as “HEPA style filters, “HEPA-like filters”, or “HEPA-type” filters. HEPA is not a brand or style. It’s an effectiveness grade. A filter either meets that grade or it doesn’t. Before particles reach the main filter, they must pass through the pre-filter. A pre-filter helps the main filter last longer. It captures big particles like cat hair before they can reach the less porous, more expensive primary filter. Most purifiers also use carbon filters to eliminate odors. These filters use activated carbon, which naturally absorbs odor vapors. This type of filter is useful for people who are sensitive to the smells around the litter box. 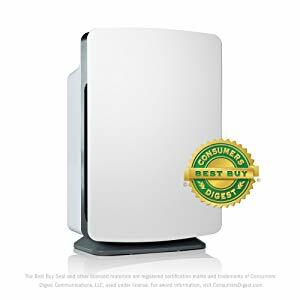 Consider how the purifier fits your budget both upfront and month over month. Your air purifier is a long-term investment with recurring costs including energy usage and replacement filters. To ensure that you’re getting an energy-efficient appliance, look for purifiers that have been Energy Star-certified. Consider that different purifiers will require different types of filters, some of which may cost over $100. Minimize your replacement costs by choosing one with reusable and washable filters. If your air purifier is too loud, it might keep you awake at night or even make it difficult to have a conversation in the same room. Scan customer reviews for mentions of the purifier’s noise level and seek units with multiple speed settings. Faster settings circulate more air in a shorter amount of time, and the noise increases along with efficiency. Multiple speed settings allow you to take control of the noise level. Choose a fast, efficient air purifier. Speed and efficiency are important, particularly if you suffer from cat allergies. An efficient air purifier can clean an entire room at least six times every hour. Most air purifiers are rated for specific room sizes and some sellers state the product’s CADR (clean air delivery rate). This value gives you an idea of how well the purifier will clean the rooms in your house. The CADR is the number of cubic feet the air purifier cleans every minute. This number varies based on which speed setting you use and which pollutants are present. Units certified by the Association of Home Appliance Manufacturers (AHAM) will release specific CADR numbers for dust, tobacco smoke, and pollen. Unfortunately for us, the testing process doesn’t involve cat hair or dander, but the standard AHAM testing is enough to help us evaluate the purifier’s efficiency and how it compares to others. Choosing a great air purifier can cut back on time spent cleaning up cat hair and is a valuable part of an allergy sufferer’s toolkit, but it isn’t a complete solution. Whether you have an air purifier or not, it’s a good idea to implement the following cat hair control strategies. Choose the right vacuum and clean the floors regularly. The best vacuums for cat hair have HEPA filtration systems, tangle-free rollers, and powerful suction to keep your floors clean. If you haven’t already, choose a vacuum and start a regular cleaning routine. Remember—even the best air purifier can’t capture hair that’s already stuck in your carpet. It takes a great vacuum cleaner to do that. Click here to read our guide to the best vacuums for cat hair. Before your cat’s hair has a chance to go flying off into the air, collect it with a brush. Brushing your cat has multiple benefits, including improved circulation, a shinier coat, fewer hairballs, and a cleaner home. Click here for our guide to the top 10 best cat brushes. If you have allergies, recruit someone to bathe your cat. Regular bathing is one of the best ways to remove dander from your cat’s skin and coat. To avoid drying out your cat’s skin, limit baths to once every four to six weeks. If you have allergies or cringe at the sight of cat hair floating in a sunbeam, the best air purifier can help you breathe easy. There’s a purifier for almost every budget, set of health requirements, and sense of style. Regardless of which air purifier you choose, remember to look for one with an effective, fast filtration system, enough purification power to clean the rooms in your house, quiet operation, and no harmful emissions.